Every once in a while an vintage photograph comes along that is a perfect representative of the era that it was taken in and this image taken in Houston, Texas certainly fits the bill. 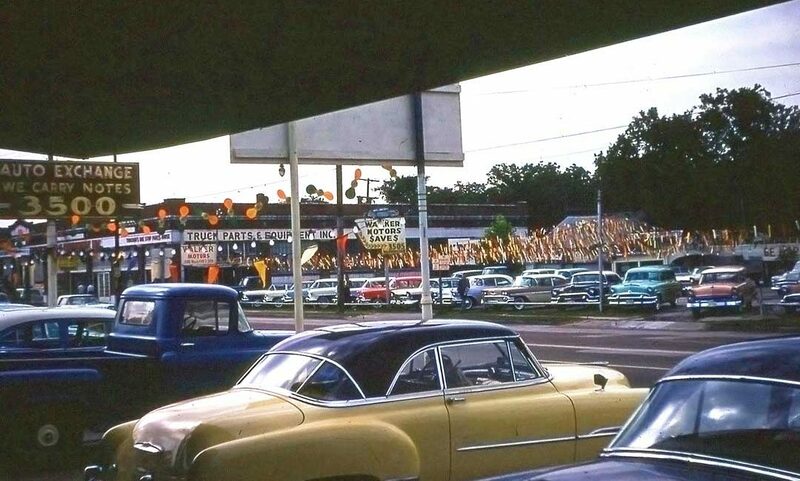 This shot was taken in the early evening during the late-1950s by a man named Strickland who operated the Auto Exchange, a used car dealership located at 3500 Washington Avenue in Houston, Texas. The picture contains a colorful view of the vehicles Strickland was offering for sale and the inventory at Walker Motors one of his competitors across the street. 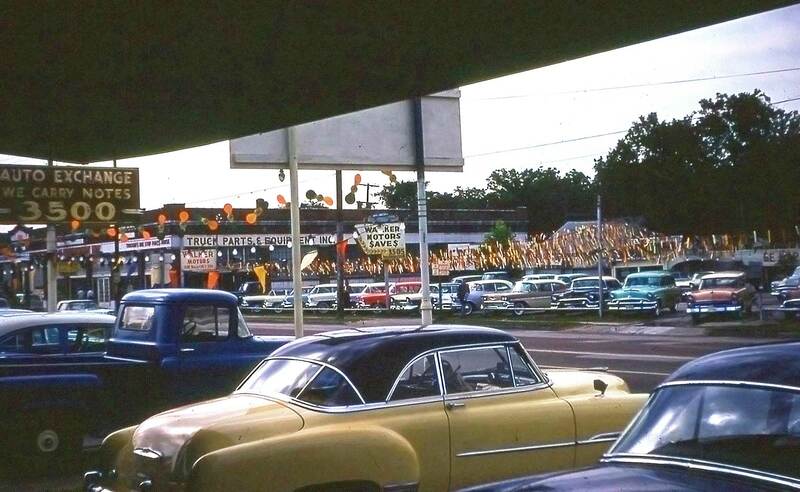 Note the unusual movement of either a string of light bulbs or streamers above the front line of cars on Walker’s sales lot while the photograph was being exposed. At the time it does not appear to have been windy as the tree limbs and leaves in the background are not moving and neither are the lights and spinners at the Auto Exchange. Share with us what you find of interest in this photo found via contributor Benjamin Ames. This entry was posted in Auto photos 1946 - 1965, Garages and Dealerships, Kodachrome Car Photos Series and tagged 1950s Automobiles, 1950s Used Car Dealerships, 1950s Used Car Lots. Those are streamers above Walkers car lot. Thin strips of plastic that catch people’s attention. Later, those would be triangle shaped plastic streamers (a staple in the used car business). Yes, but why would streamers be so bright in the early evening at a time when it appears there is no direct sunlight on them? Those are two-color fan blades that turn in the wind. You can easily see two of them against the sky under the large white sign. Those spinners were common at dealer lots in the 1950s. Evidently, the film was sensitive to the one color on those spinners. David, I think maybe it’s not that they are so bright, it’s just that there are so many of them. Usually you see one or two rows (the whole idea is that their movement is designed to catch the eye of passersby). In this case it appears there’s a line of streamers every few feet or so apart. Ol’ Walker got a little bit of everything, trucks to Caddy’s, he’s got it. Perhaps those are some kind of streamers. Notice the wonderful colors of the 1950’s! Across the street that would be a ’54 Monterey wagon (emblem integral with the upper grille trim) beside a ’56 Cadillac Coupe (bullets at the very top of the grille). And a `55 Country Squire on the other side, Pat. Next to it, I just see the nose of a `57 Buick in that nice shade of dark copper they had that year. I’m guessing this was shot sometime around 1960 or so. On the far left, looks like a `59 T-Bird coupe coming down the street, and the lots has a few `58s already. Just ‘beam’ me back there with maybe $5K cash in an envelope, and I’ll see what my money can buy, OK? That `56 Cadillac looks mighty tempting! Farther down, below “INC.” on the building, a white and ? ’55 Olds Holiday Coupe and a ’55 or ’56 Dodge…maybe a ’55 Custom Royal Lancer or a ’56 Custom Royal or Coronet convertible. In the foreground center is a black over yellow 1951 CHEVROLET Deluxe Bel Air Hardtop. Does anyone have a left hand gingling valve for my 1956 Heath Robinson time machine?The 51 Chevrolet and its siblings are to my eye the most handsome of cars.There is a Olds near me in that fashionable patinated look which I do not care for ..but the shape is wonderful.20.13 GMT. I have a right hand gingling valve only. BUT IT’S NOS IN THE ORIGINAL PACKAGE! thanks but as you know they are handed pairs.I have a spare set of graviton shield control coils. .Damaged box though. All I have left is a LH franistan for frebarbing the glarbige. If you want it, let me know. I’m guessing that “we carry notes” means they either pay cash for your used car, or that they hum to your tune, or maybe they finance your purchase? They financed the purchase. AKA “Tote the note” lots. I think that might mean “buy here, pay here”. I would be ecstatic with any car a thrown dart might hit. The ’51 chevy would be great, even with the blemishes and the missing fender skirts. And the powerglide. (I assume that by the position of the gear shift.) The ’55 pickup is nice too. ’57 Fords and Chevys were plentiful across the street. Ahh, for the good ole days. Did they remove the PowerGlide writing over the trunk badge? A Ford pickup in the foreground? the Uk had punitive taxes and very tight credit control in the fifties making blue collar new car buying hard.Did the US regulate consumer credit? Regulate consumer credit? Not directly. But I’m sure the Federal Reserve system controlled interest rates to keep the economy going or inflation in check, much like today. And despite the rise cold red glasses many seem to have about the 50s, there were a couple of bad recessions, so I’m sure the Fed did something. At any rate, it wasn’t nearly as austere as the UK in the early-mid 50s. Most Americans are shocked to learn the UK has food rationing well into the 50s as an austerity measure. Car guys will know of the “export or die” edict to the auto industry. But having a UK born and bred wife, she tells me that in her middle class neighborhood, (a nice semi-detached home with back garden and garage) her dad’s new car was the exception rather than the rule. Her mom relied on a bike for shopping. I still remember the old guy who hung the banners and lights above the used car lot at Northgate Lincoln Mercury in Tampa. He had mussels like Charles Atlas ! He arrived about every other month to replace everything that the Florida weather ruined, hurricane winds and scorching sun did it’s job. His work turned a monotonous job into something spectacular as soon as the lights turned on at sundown. It was like an amusement park for adults. Myself and others always thought the guy was broke because he drove an old beat up ford pickup, until he arrived one day in a Cadillac looking to buy a car for his wife. Dealership owners today could learn something from this photo. I’m guessing that the guy standing across the street reached up and plucked that garland of mylar like streamers causing it to ocillate for the benefit of the photographer. You’re right, AGB. The script is not there. It is probably a three speed, or the script was removed for painting and not replaced. If you really use your imagination the back half of the body paint seems to be a little darker shade. Does anyone else remember the poorly vented gas tank fill pipe on the ‘56 Chevy?It was under the left tailight. I hated those things because no matter how carefully and slowly I filled someone’s tank when I was working in a station in the late 50s, they always blew gas back on me. I used to run behind the building as they pulled away from the island in case the wiring had frayed and one touch of the brake caused a spark blowing up the car. Reminded me that we had neighbors that moved in about 1969-1970 with a yellow body black roof 1950 Chevrolet Hardtop (the first year) – it was pretty ragged out then and got progressively worse over many many more years – he turned out to became an Austin Healey fan with an early 3000, as he apparently secretly so loved my parents 1961 3000 (when he restored his he even painted it to match – Healey Blue with dark blue interior and top). We moved in about 1972, but saw them occasionally through a mutual friend and then later British Car Club activities.